Journalist, world traveler, and avid eater Graham Holliday has sampled some of the most exotic and intriguing cuisines in countries around the globe. However, none has intrigued him more or stayed with him longer than Korea’s. 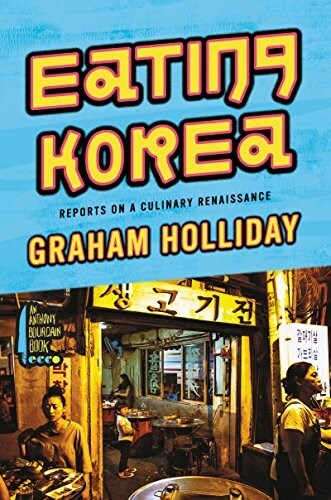 On a pilgrimage to Korea to unearth the real food eaten by locals, Holliday discovers a country of contradictions, a quickly developing modern society that hasn’t decided whether to shed or embrace its culinary roots. Devotees still make and consume traditional dishes in tiny holes-in-the-wall even as the phenomenon of Korean people televising themselves eating (mukbang) spreads ever more widely. Amid a changing culture that’s simultaneously trying to preserve what’s best about traditional Korean food while opening itself to a panoply of global influences, that’s balancing new and old, tradition and reinvention, the real and the artificial, Holliday seeks out the most delicious dishes in the most authentic settings-even if he has to prowl in back alleys to find them and convince reluctant restaurant owners that he can handle their unusual flavors. Holliday samples soondae (or blood sausage); beef barbeque; bibimbap; Korean black goat; wheat noodles in bottomless, steaming bowls; and the ubiquitous kimchi, discovering the exquisite, the inventive and, sometimes, the downright strange. Animated by Graham Holliday’s warm, engaging voice, Eating Korea is a vibrant tour through one the world’s most fascinating cultures and cuisines.